Aegis (David): I recently had the opportunity to ask Pete Marston, son of William Moulton Marston (the creator of Wonder Woman), five questions, and below are the responses. Thanks to Andrew D. and Carrick E. for some of the questions. Wonder Woman Network is beyond words. You simply have to check it out. 1. You have been collecting Wonder Woman memorabilia for quite some time. What is your favorite piece in your collection and why? My favorite items in the Wonder Woman collection are several pieces of Harry Peter’s original artwork. They take me back to the early Wonder Woman days. 2. What was it like being the son of the creator of Wonder Woman? How did that fame affect you growing up? You’re obviously interested in Wonder Woman, as seen by your Wonder Woman Museum, but were you always interested in her? Interesting question. To an outsider it might appear that the Wonder Woman project would bring instant fame, but that is not the case. My Dad was already widely recognized for his development of the lie detector plus several books he had written, and his work as a consultant in the motion picture industry. In the Marston family world, the Wonder Woman evolution was just another fun event. 3. What are your opinion(s) of the “Wonder Woman” eras which followed your famous father? Which do you think lived up to the standard set by your father? Are there any that you think failed to do so? If the question refers to different approaches to the scripting of Wonder Woman comics or film events, then the fact that DC Comics sustained WW in different media deserves an enormous thank you for their continued efforts. The fact of the matter is that any time you change to a new creative director, their outlook will be different than any former one. I am very grateful to DC Comics for sustaining our lady Wonder Woman because her main theme for a Balance of Love and Force carries on. 4. If your father created Wonder Woman today, how would she be different or would she? 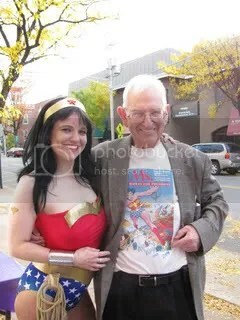 Wonder Woman was created in response to a challenge to my father, by M. C. Gaines, who laughingly said “Hey Bill, why don’t you write a comic?” Dad had been retained as a consultant to help take comics out of the wartime venue and make them good for kids again. When he went home and talked the idea over with my mother, she said, “OK fine, but why not give us a Super Heroine because we have enough male heroes already?” Thus Wonder Woman was born and was created to perpetuate a theme that would not be any different today. 5. How do feel about what has been done to Wonder Woman in recent years, mainly some of the controversial things? Do you believe these things are making the character evolve or going further away from the purpose of the character of a superhero who uses love and compassion to the fight the forces of evil rather than being the heading chopping “badass” warrior many want or view her as? I feel that the portrayal of our gal Wonder Woman has changed as the perceptions of the new writers have varied. I do not think I can criticize their work simply because they come from a different school of thought. I pray that future exposures for Wonder Woman will swing back closer to the original concept; and this will probably happen under the exciting new organization and dynamite fresh leadership at DC. The CBR Board link to comment on this interview is here.